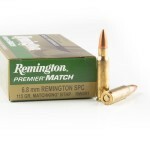 The 6.8mm Remington SPC (Special Purpose Cartridge) was introduced in 2002 by Remington, which worked with the US Army Marksmanship Unit to develop a more effective cartridge than the 5.56 NATO for close range urban combat. 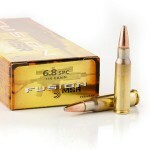 It sits between the 5.56 NATO and 7.62 NATO in power and is compatible with AR-15 / M-16 platform rifles. Converting an AR-15 chambered in 5.56 NATO requires a new barrel, bolt, and magazine; complete upper receivers can make this process relatively easy, as the user does not need special skills or tools. Although it did not receive widespread adoption in the US military, the 6.8mm Remington SPC performed well with special forces in Iraq and Afghanistan. As expected, it was more effective in urban engagements than wide open spaces. A typical round of 6.8mm Remington SPC ammo fires a 110 grain full metal jacket bullet at a muzzle velocity of about 2,600 feet per second. The use of a bullet approximately double the weight of that in the 5.56 NATO results in better penetration and energy transfer at close to medium range. 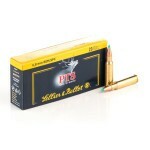 This cartridge performs relatively well from the short barrels of M4 Carbines and other SBRs. 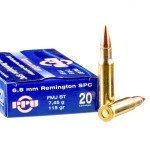 6.8 SPC ammo is available from most major manufacturers. 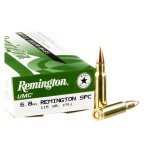 Remington's own UMC brand and Federal's American Eagle series are relatively cost-effective options for the range. 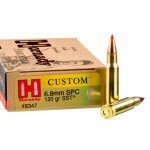 This round can be used for hunting midsize game with polymer-tipped and soft point ammo from Hornady's Custom series and Federal's Fusion series. Match grade loads firing open tipped match bullets are also available; some of these are labeled HPBT (hollow point boat tail) but are non-expanding rounds designed for accuracy rather than expansion.